Due to the recent hurricanes, raw materials including resin, aluminum, adhesives, and corrugated packaging have continued to escalate. Below is a list of the recent price increase notification letters we have received from five manufacturers. The letters generally include details about the price increase percentages and which of that manufacturer's product line will be affected. The prices on our website will typically be changed the business day before the manufacturer's increase goes into effect (or soon thereafter). Below is a list of recent price increase correspondence we have received which includes details about the percentage price increase and which of that manufacturer's product line it will affect. The prices on our web site will typically be changed the business day before the manufacturer's increase goes into effect (or soon thereafter). Spring is the season of home improvement. And now that it's almost here, many people are considering ways to freshen up their homes and offices. One of the best ways to do this is to paint your walls. Not only will this brighten your mood, but it's also a good investment – especially if you're planning to sell during the spring housing market. A freshly painted interior will help the house show better to prospective buyers. Whether you plan to do-it-yourself or you're a longtime pro, you'll need to make some decisions about the type of painters tape to use. Your choice will depend upon the type of surface being painted, whether it's indoor or out, and any creative or artistic requirements. Here's a quick primer to help you choose the right painters tape for your project. And don't forget to check for removal tips at the end of this post. Why use painters tape and not other types of tape? Unlike other types of masking tape, painters tape is specially designed for painting applications where clean removal is a requirement including in cases when the tape is exposed to direct UV light. It can be used on glass, vinyl, metal, wood, painted walls and trim. There are several types of painters tape, and which one you choose depends upon the job you need it for. As you prep your room for painting, you'll want to keep floors and furniture from getting hit by paint drops. You can drape your furniture with old bed sheets and cover floors with plastic sheets, but as you paint, these can shift, inadvertently exposing the edges of furniture or leaving spots on floors. Duck Brand Pre-Taped Painter's Drop Cloth is ideal for protecting floors and counters while painting. This is a 2-mil thick plastic drop film that is pre-applied to a removable painters tape. The plastic film resists tears and punctures, and the removable cloth tape holds the film securely in place, so there's no slipping and sliding. It's designed to remove cleanly for up to 4 weeks. If you already have drop film or cloth and just need a double-sided tape to apply it, Nashua's CleanDrape is a great choice. The adhesive cloth side of the tape holds up the film or dropcloth while the adhesive painters tape side goes up against your drywall. CleanDrape's blue painters tape side offers clean removal for up to 14 days from a variety of surfaces. Once you've got floors and furniture protected, it's time to prep the baseboards, walls and ceilings. Painters tape can be used as a guide to keep lines straight and protect surfaces from getting spotted with the wrong color. Shurtape CP-60 Razor Edge tape is an ultra thin painters tape used to create razor sharp lines. Perfect for painting stripes, diamonds, and other patterns on walls. Its special paper backing reduces bleed-through and its low adhesion allows it to be easily removed after longer periods of time (for up to 60 days). If you're painting a newly constructed house or an addition, you will probably be painting drywall. JVCC PGM-UV Painter's Grade Masking Tape is a good choice because its peel adhesion does not increase with time, allowing for removal from a wide variety of surfaces without damage. 3M Scotch-Blue 2090 Painters Tape for multi-surfaces is a medium adhesion tape ideal for paint masking on multiple surfaces including painted walls and trim, woodwork, glass and metal. It can be removed cleanly without adhesive transfer or surface damage for up to 14 days, even in direct sunlight. The backing saturant is solvent and moisture resistant so it resists paint bleed-through, and the adhesive doesn't transfer when the tape is wet. However, this tape is not designed for use on wallpapers, unpainted wallboard, wood floors or poorly bonded surfaces. Delicate surfaces, such as wallpaper, freshly painted or unpainted wallboard and drywall, ceiling tiles, or masking for faux finishing, will require a lower adhesion tape. Shurtape CP-28 30-Day Purple Painters Tape, also known as 30 Day ShurRELEASE, can be applied to delicate surfaces for up to 30 days and then removed cleanly without causing surface damage. If you're painting special surfaces, such as cured painted walls, unfinished wood and wood trim, glass, metal, and stone, choose a medium-adhesion tape like FrogTape's Multi-Surface Painters Tape. This tape removes cleanly from most surfaces for up to 21 days (7 days in direct sunlight). Its patented PaintBlock® Technology prevents latex paint from bleeding by forming a micro-barrier along the edges (it reacts with the water in latex paint). You get a fully sealed tape edge resulting in the sharpest paint lines possible. Painters tape also can be used to create paint designs on walls, furniture and other surfaces. FrogTape Shape Tape Painters Tape comes in three pre-cut repeating patterns: Chevron, Scallop and Wave. Creative painters can use this tape to create horizontal, vertical, or diagonal designs. It can be tricky to create sharp lines on textured surfaces such as heavy knockdown, light knockdown or orange peel, without bleeding. But FrogTape Textured Surface Painters Tape comes with a bottle of Liquid PaintBlock® Edge Sealer™, which forms a micro-barrier sealing the edges of the tape. As a result, paint doesn't bleed and you can create super sharp stripes, patterns, and designs on these types of textured surfaces. When all of the painting is done, it's time to remove the tape. Here are a few tricks to make sure it all comes off smoothly. Score the edge of the tape with a razor blade first. Pull the tape slowly and at a 90 degree angle. If you're still uncertain about how to choose the right painters tape for your project, our Painters Tape Comparison Matrix will help you compare and choose based on a variety of criteria. Each year, GES, the global event marketing company, releases its Trend Tracker white paper, identifying 50 emerging trends in the trade show and event industry. The 2015 report was released in January, and it covers four areas: budgeting and planning, marketing, technology, and design. This year, the report noted one very big overarching trend: Brand Experiences. Marketers are aiming to connect and engage attendees with their brands and with each other. As a result, GES says, "marketers will go 'all in' on experiential with bolder budgets, bolder strategies and bolder experiences that tie together creative, execution and data analysis." High-tech, including gamification, drones, and next generation audio/visual, will also be front and center during 2015. In a post-report follow-up blog post, Paul Wedesky, the senior vice president of Audio Visual Services for GES, describes several additional audio visual trends for 2015. Here are a few of our favorite insights both from the report and from Paul's post. Exhibit booths are being designed both to incorporate technology and to be re-purposed. According to GES, designers are being challenged by clients to create experiences that can be taken on the road after the event, to be used by the sales team. This includes not only product display elements such as digital catalogs, but also exhibit booths. Helping your salesperson recreate this experience on the road is a lot easier if you have the right adhesive tape to tamp down wires and secure media equipment. We recommend packing a roll or two of JVCC GAFF30YD Gaffers Tape, an economical and popular general-purpose gaffer tape, along with the booth. With clients looking to create more inviting spaces, exhibit structures are becoming more open. At the same time, they're demanding interactive features, including more LED displays, touchscreens and tablets. To keep wires under control and out of the way, but also have flexibility of movement, you can use JVCC Wire-Line Cable Cover Tape. The adhesive-free zone in the center of the tape allows for cable and wire to be easily pulled through, and no residue will be left behind on your cables. More marketers are forging partnerships with artists, incorporating more creative and cultural elements into their events. For example, GES noted that "TD Bank commissioned artists to turn its storefronts into mini art galleries." In case you're wondering, you can create some amazing artwork with adhesive tape. Check out some examples HERE. And to see a list of tapes used in the examples click HERE. More high-tech monitors are reaching the trade show floor in 2015, according to Paul Wedesky. He has noticed 3D and 4K monitors being using at medical and pharmaceutical trade shows to enhance the brand experience, and he believes that 3D eventually will become the norm. For protecting and anchoring the monitors' electrical wires, we recommend Polyken 510 Premium Grade Gaffers Tape, which has a softer adhesive than most other gaffers tapes so it adheres better to carpets. Another trend in audio visual Wedesky has noticed is an increase in projection mapping, in which special software is used to spatially map a design or scene onto an object, such as a building. The design usually fits the shape of the object. When constructing your object, an ultra-high bond tape will help keep your structure together and stable. The 3M 4941 VHB Tape is a good multipurpose option, as it's ideal for use in many interior and exterior structural bonding applications. It's strong enough to replace rivets. As a way to test ideas and manage budget more effectively, event planners are creating prototypes of their space. "It allows decision makers to visualize the concept, and for changes to be made quickly without impacting the budget," GES says. A good all-purpose duct tape will work for temporary structures. We recommend Polyken 2280 General-Purpose Duct Tape, which is often used for bonding and holding applications and bonds well to a wide variety of smooth and rough surfaces. It's easy to unwind and tear, so it's perfect for manual applications. 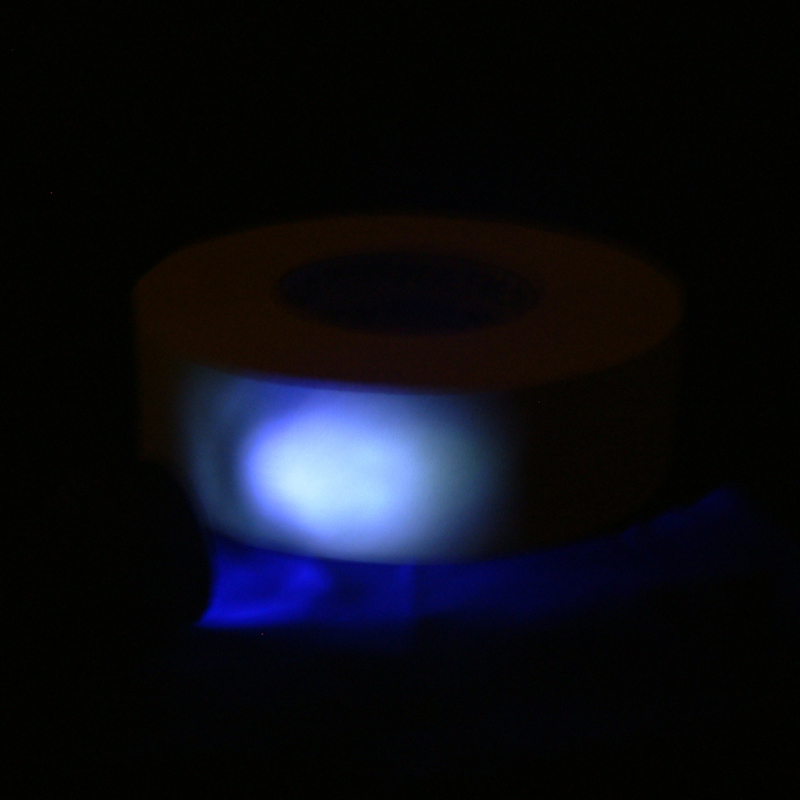 The tape is also available in a variety of colors. Printed product brochures have long fallen out of favor, but show attendees are still interested in receiving more information. Kiosks designed to deliver electronic brochures can be incorporated into the exhibit or as a standalone. Attendees can download only the material they want. Creating and deploying a robotic attendee, as EventMobi did at IMEX, might be on every event planner's list now. If you plan to have your robotic ambassador travel the show floor, you can create a suspension system using double-sided sticky tape. By attaching the wheel servos using double-sided sticky tape such as Scapa S301, all four wheels will remain even on an uneven plane. Finally, when you're packing up your exhibit, be sure to have plenty of Shurtape HP 500 on hand to seal your boxes. This tape is ideal for sealing cartons, and is recommended for overstuffed or underfilled boxes. It's perfect for trade shows, when you're likely to be re-packing older cartons or taping up bulky or odd-shaped materials. Gaffers tape, which is also referred to as gaffer tape, is a form of adhesive tape that has numerous uses. Gaffers tape can be purchased in rolls that come in varying lengths as well as widths. The traditional color of this tape is a matte black but you can find them in several other colors such as blue, white, burgundy, gray, fluorescent pink and so on. 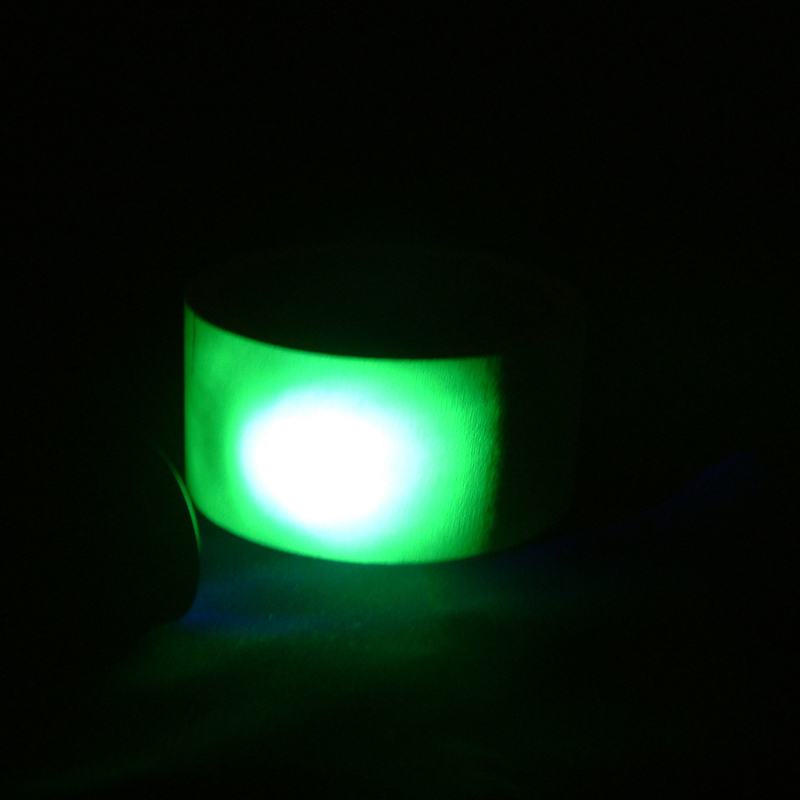 Gaffers tape is quite similar to duct tape in the sense that it can be useful in an array of applications. However, unlike duct tape, this tape will not leave any adhesive residue when it is peeled off a surface plus it offers a matte finish. So, what are some of the numerous uses of gaffers tape? A common use for gaffers tape is in positional marking. It is commonly used in the theater industry to mark positions on the surface of the floor that will indicate where props are supposed to go. It is often used in the theater and TV industries to mark actors' starting positions. What’s great about this tape is its durability. It won’t easily wear down due to foot traffic. In addition to marking starting positions, it can also be used to coordinate props since it comes in a wide variety of colors. Production studios, and convention halls also use gaffers tape to manage cables. Many cables in one area can prove to be a hazard as people could easily trip over them and have a nasty fall. With this tape the cables can be firmly affixed to the floor thus lowering the chances of any accidents happening. And when it is time to remove the cables and wires the tape will not leave them sticky like a duct tape would. Since this adhesive tape is a vinyl-coated cloth product it pairs nicely when covering tears and rips in vinyl seating like on buses. It comes in wide widths like 3 and 4 inches wide and in colors such as burgundy and dark green which works great for matching common bus seat colors and making repairs. Gaffers tape is also widely used when binding books since its matte appearance is preferable to the shinny look you would get back with a duct tape. Its cloth backing also makes it very conformable so as to wrap nicely around a book binding. Typically a high tensile strength gaffers with good adhesion is used for book binding applications such as Shurtape Professional Grade (P-672) gaff. Gaffer tape is not only used for positional marking in the theater industry, it can be used in plenty of other places. For example, it can be used to mark a hazard area, an incline, flights of stairs, and so on. FindTape.com sells gaffers tape in all its varieties. Because of the popularity of the 2-inch wide gaffers tape test pack our converter has recently made available a new test pack that contains a variety of 3-inch wide nominal (actual cut 72mm) black duct tapes. FindTape DUCT-TEST-PACK Duct Tape Test Pack consists of 8 rolls of 3-inch (72mm) wide x 10-yard long tape. The tapes range in thickness from 9 to 13 mils; longitudinal tensile strength from 22 to 50 pounds per inch; and peel adhesion from 39 to 80 ounces per inch. The lower adhesion tapes are sometimes used as a less expensive alternative to gaffers tape in the hotel and meeting industries. Currently the specific duct tapes offered in the pack include: Shurtape PC-600 General Purpose Grade Duct Tape, Polyken 223 Multi-Purpose Duct Tape, Polyken GP2280 PolyNash General-Purpose Duct Tape, Shurtape PC-618 Industrial Grade Duct Tape, JVCC DT-CG Contractor Grade Duct Tape, Shurtape PC-622 Contractor Grade Duct Tape, Nashua 357 Premium Grade Duct Tape and Polyken 231 Military Grade Duct Tape. Also please note the GAFF-TEST-PACK was recently increased to 10 rolls of 2-inch wide x 10 yard long tape and the current lineup includes: Scapa 125 Economy Grade Gaffers Tape, Polyken 510 Premium Grade Gaffers Tape, Scapa 225 Premium Grade Gaffers Tape, Shurtape PC-628 Industrial Grade Gaffers Tape, Pocono GT-226 Clear Adhesive Gaffers Tape, Pro Tapes Pro-Gaff Gaffers Tape, Shurtape P-665 General Purpose Gaffers Tape, Scapa 425 Pro-Grade Gaffers Tape, Shurtape P-672 Professional Grade Gaffers Tape and JVCC J90 Low Gloss Gaffer-Style Duct Tape. 2 inch x 30 yard rolls of Shurtape PC-626 Camouflage Duct Tape are now being stocked. It is the first duct tape that features the official digital pattern used for U.S. Army combat uniforms, making it the closest match to soldiers' camouflage. The 30 yard length rolls make it very easy to carry around although we do allow you to still special order the regular 60 yard length rolls. The cloth tape's lusterless film reduces light glare, an advantage for both the military and for hunters. Shurtape PC 626 is an ACU digital camouflage pattern duct tape with high holding power. This high performance, polyethylene coated, waterproof tape is also used for sealing, packaging, waterproofing, holding, camouflaging, sound deadening, covering reflective surfaces, and patching applications. 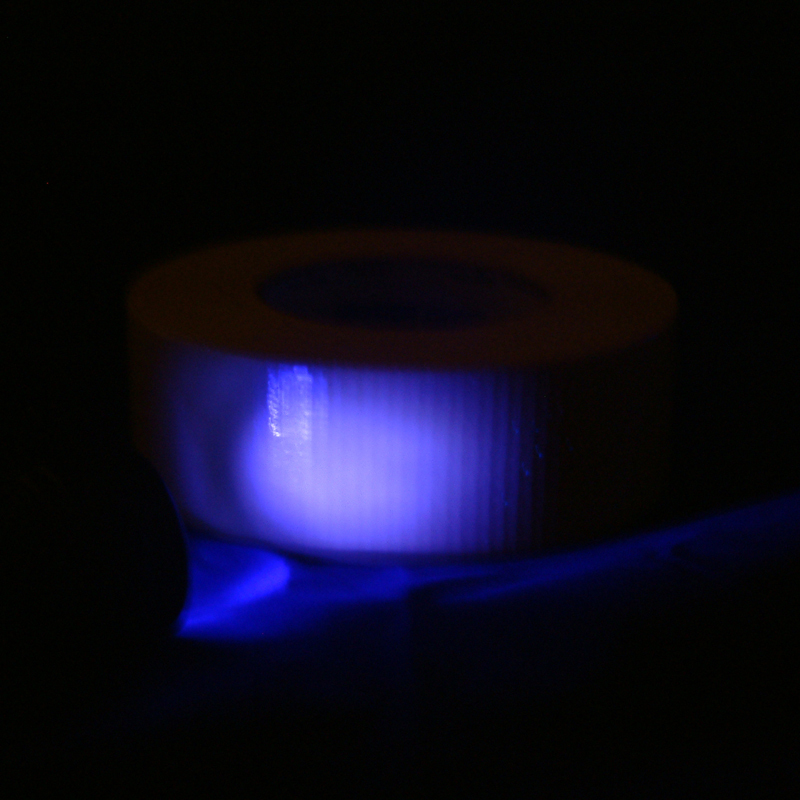 How Do Tapes Show Up Under Blacklight? 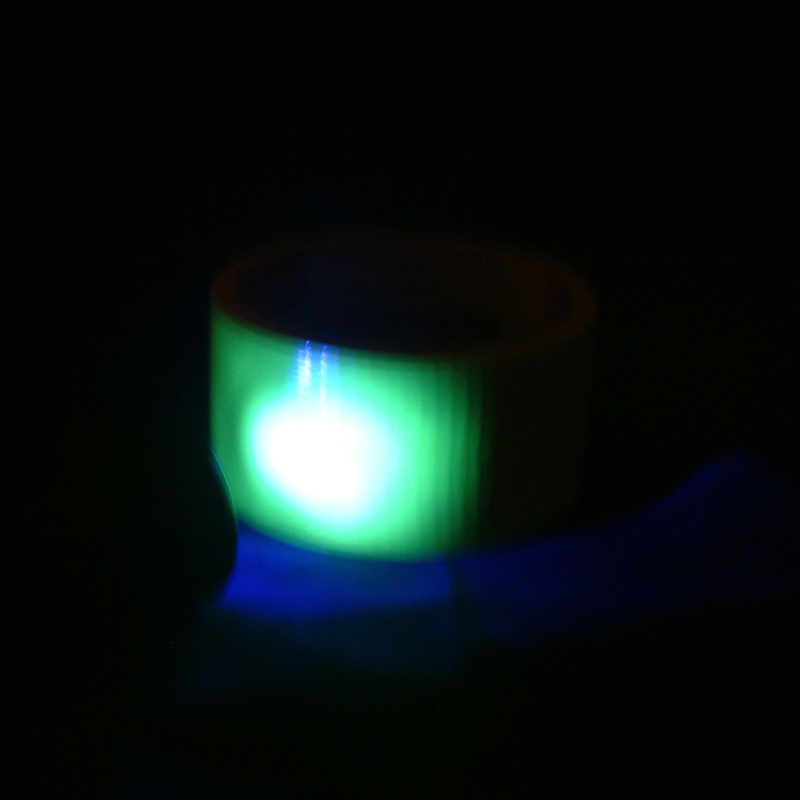 *** Our personal observation is that the fluorescent gaffers definitely showed up the best (especially outside of the light tent), but we did get the PC-619 yellow duct tape to fluoresce also. Outside of the light tent the effect on the PC-619 (polyethylene-coated cloth duct) was not as dramatic as it was on the 510-Neon (vinyl-coated cloth gaffers) though.